The Rev. 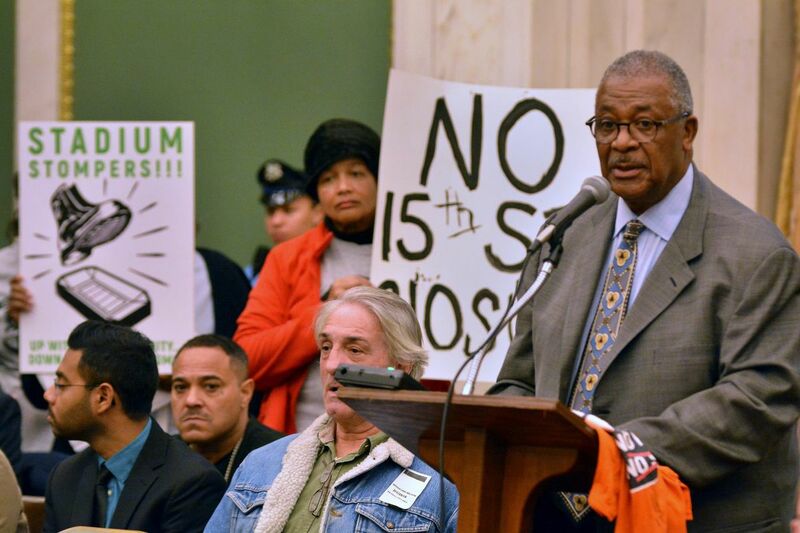 William B. Moore with the “stadium stompers” group adresses Philadelphia City Council regarding the proposed Temple University Football Stadium during their meeting at City Hall on Thursday February 1,2018. Jocelyn Marrow was finishing up her day at Amos Recreation Center, where she runs an after-school program, when a group of Temple students walked in with a stack of pizzas. They were members of Temple Student Government arriving to hold a community forum to discuss the school's plan to build a football stadium a block from Marrow's house in North Philadelphia. The meeting was news to Marrow, but she was intrigued. "Temple could learn a thing or two from its students," Marrow said, settling into one of the plastic chairs for the meeting this week at the city-owned center just off campus. "I've got more to say than you all want to hear about this." Preliminary sketch of the proposed Temple on-campus football stadium. In the two years since Temple announced plans to build a football stadium on campus, the university hasn't held a public meeting, opting instead to meet privately with select neighbors or groups. Now, as the school finalizes a proposal to send to the city's Planning Commission, neighbors, faculty, and students who oppose the project say they're frustrated that the project is moving forward before hearing from them. The Temple Student Government, which says it won't support a stadium that negatively affects neighbors, called Tuesday's meeting to get input from people and to see if the university had been reaching out. "Whoever they're talking to, it's not me," said Marrow, a block captain on the 1700 block of 16th Street. "I've got so many questions but no freakin' answers… ," said resident Gail Loney, a member of the Stadium Stompers, a group opposing the stadium. Temple officials met with the group in May, but Loney said it's been radio silence since. "I'd like to see a real community meeting. I'd like to see a list of community people who want the stadium. There is a way to do things, and this is not the way to do things." Temple proposed the on-campus stadium as a way to reclaim fees paid to use Lincoln Financial Field and to boost the football program's national profile. The $130 million stadium, which would include classroom, retail, and event space, would be paid for through fund-raising and bonds backed by money that would otherwise go toward rent at the Linc. The school pays $1 million a year to use the stadium, but rent could go up to $2 million a year (plus $12 million up front) if Temple signed another lease with the Eagles. The university has said naming rights also would absorb costs of the new stadium. Temple owns the land where the stadium would be built, bound by Broad Street on the east; Norris Street on the north; 16th Street on the west and university buildings on the south. No residents would be displaced, the university has said. The city-owned and -operated Amos Recreation Center also would remain. University president Richard M. Englert sent a letter to all university students and staff Tuesday outlining 10 reasons he thinks the stadium is a good idea, including an opportunity to improve the relationship with the community, and asking for feedback. The university has proposed creating a Special Services District, which would maintain the area. Designs would limit the height of the stadium's north end to the height of the row houses on Norris Street. Some neighbors worry that even with design considerations and a dedicated cleanup staff, the persistent trash, noise, and parking problems they already deal with living in close proximity to college students would magnify when 35,000 game-goers tailgate in the vicinity. The plan also would close 15th Street, a main thruway in North Philadelphia, between Norris Street and Montgomery Avenue. Englert told the Inquirer and Daily News that discussions were ongoing with neighbors but did not answer questions about what specific meetings were taking place or who could attend. He said people would have an opportunity to comment on the project during public hearings at the Planning Commission. The commission usually meets midday in a conference room on the 18th floor of 1515 Arch St.
"The problem is these guys have decided they want the stadium. They've already made up their mind," said Jennie Shanker, who teaches at Temple's Tyler School of Arts. "It's an insult. It's an insult to the community, it's an insult to the faculty, and actually it'll be to students' detriment in the long term." Shanker was one of 502 faculty members, in the school's bargaining unit of 2,800 members, surveyed about the stadium. Seventy-five percent of respondents said they were against it. Next week the Temple Faculty Senate, a group of about 100 faculty members from each school and college, will vote on a resolution calling on the university to halt its decision to build the stadium. The resolution also asks administrators to hold meaningful talks with the community and release the $1.25 million feasibility study it conducted before proceeding. The feasibility study is important because of schools like Temple that built stadiums and then struggled to sell tickets, said Steven Newman, president of the association and an associate professor of English. "If they found a way for it to work, great, but let's see it. What's the problem in sharing the numbers and the assumption behind it?" Temple was built as a commuter campus but has increasingly grown its enrollment and its footprint. While that has resulted in some jobs, development of abandoned buildings and retail in the area, it's also affected the neighborhood's identity. As Temple has expanded, neighbors have left. The stadium is only the latest and largest tension to arise. Neighbors fought the Liacouras Center in the 1990s. "People I know in North Philly, they don't feel like Temple listens to them," Newman said. "And unfortunately, the stadium and the way it's being proposed sends a message that we're not listening to you even though we all live here." Regardless of internal opposition, the only thing Temple needs to move forward is support from the city's Planning Commission and City Council, which would have to approve zoning changes for the construction, namely the closure of 15th Street. On Thursday, a small group representing the Stadium Stompers protested at City Council. The Rev. William Moore, pastor at Tenth Memorial Baptist Church, urged members at the meeting to "hear our cries. Temple has not heard our cries." City Council President Darrell L. Clarke, whose Fifth District includes Temple, has said he'll support a stadium only if the community is on board. He didn't have an answer for neighbors frustrated with a lack of access to planning discussions. "It's Temple's responsibility to get the community on board. It's not my responsibility," he said. "It's my responsibility if the community decides it's interested in having a stadium to work out whatever issues remain." Marrow did not join the small rally Thursday. She was working at the recreation center, which hosts mentoring programs, gymnastics, and dance classes for kids in the neighborhood. She says she'll keep protesting, but she'd bet money that a stadium will rise next to the recreation center in the next few years. That's part of why she wants in on the discussions. Might Temple consider helping out the struggling center? The ceilings leak; the tile floors are peeling; the kitchen is unusable. "I'd like to know, what does Temple have in store for Amos Rec?" Marrow asked. "When are they going to put some money into the rec center? When are they going to give something back to the community instead of taking everything away?"